George and Louisa carried on the family tradition of getting pregnant without getting married. The wedding was in April 1875, and their first child, Clara Louisa, was born in Plymouth in November, less than eight months later. Or I could be more charitable, and say she was born prematurely. Her birth registration shows her father as George Cockram - but by the time Clara was born, George Cockram was gone, in more ways than one. In June 1875, only two months after marrying Louisa, he had sailed for Canada on his own, using the name Thomas Smith. And a Smith he would be from that time on. 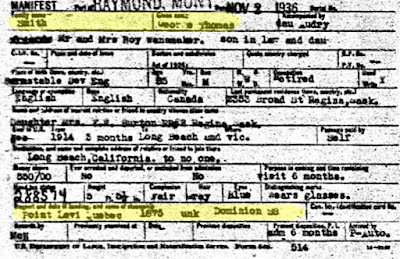 I know that he arrived in Canada in 1875 on the SS Dominion, from a 1936 border crossing document, where he was asked when and how he first arrived in Canada. And there's only one passenger list from that ship in that year that lists anyone who could be him. That was the June sailing, which carried a Thos. Smith, age 24, travelling alone. in 1875, exact date unknown, on the SS Dominion. But I asked myself if I was making too many assumptions. Was the information he put on the 1936 border crossing form false, either by design or due to failing memory? He was in his eighties by then, so it's certainly possible. 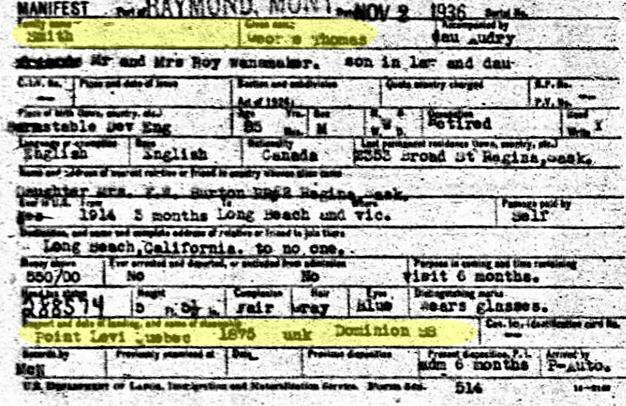 Looking at his 1901 and 1911 Canada census records, I found that he said he had immigrated in 1875 on both of them, so I'm pretty confident about the year. * But he might have remembered the name of the ship wrong - maybe he travelled on another ship in the Dominion Line, rather than the Dominion itself. So I checked every passenger list for every ship in that line that sailed to Canada in 1875, and didn't find anyone else who looked like George, or Thomas. So until proven wrong, I'm assuming he really did sail on the Dominion in 1875, and this was the first time he used the name Thomas Smith - just two months after getting married using the name George Cockram. Did something happen in that brief period that led to the name change? * I have to admit that the 1906 Saskatchewan census says he arrived in 1882, and Louisa in 1885! Where that came from, I don't know, but for now I'm assuming it was a mistake on somebody's part, as I know that they were raising a family in Ontario in 1881.